Event flooring solutions can really make your outdoor party rock. Here we discuss how to pick the perfect dance floor. An outdoor party is an opportunity to create a memorable and unique event. 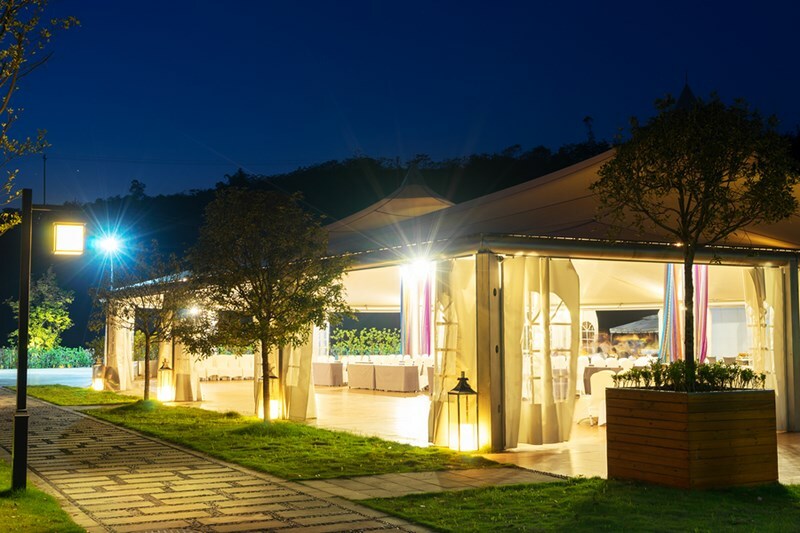 There’s an outdoor event tent for all occasions, but the focal point of your guests’ attention will probably divert to the dance floor as the evening progresses. Most people enjoy getting up and having a boogie, and what better way is there to celebrate a marriage than joining the happy couple on the dance floor? Our event flooring solutions range from covering the whole tented area to creating an exceptional dance space. There’s flooring for all requirements and all budgets. In this article, we’re going to discuss how you can create the perfect dance floor. There are several considerations you need to make before deciding on the ideal dance floor for your tented event. You’ll need to think about how many people are attending your party, and how many are likely to be dancing the whole night away. This will give you an idea of the space your dance floor will take up. If your event is to be held at night, you might want to consider what type of lighting will be needed on and around the floored areas, especially where people are dancing. With perfect lighting and accessories, the dance floor becomes a real centerpiece. Take time, also, to consider the surface where your dance floor will be positioned. Most flooring can be placed on any flat surface, but sloping or uneven surfaces are a little trickier. This doesn’t mean a dance floor can’t be created, but it might take a little more effort and some technical wizardry. Let’s say you’re expecting a hundred guests. Of these, you estimate that a little more than half will be on the dance floor at any given time during the evening. How much space will be adequate for your dance floor? A dance floor should be intimate, but not dangerous. You don’t want people crushed against each other, and neither do you want wide, open spaces between dancing partners. We’ve found that a good rule of thumb is to allow around three square feet per dancer. So, with 60 guests on the dance floor, you’ll need approximately 180 square feet of dance space. A dance floor which is 12 feet by 16 feet will give you 192 square feet of event flooring for dancing. The tent décor and color scheme. Your lighting will need to complement these and enhance the ambience. How light you want the dance floor to be. This might be relevant to your guests, especially if most are elderly or young children. The event flooring solution you select for your dance floor. What style of dance floor do you want? Do you really need a dance floor? A dance floor naturally becomes the focal point of your party as it progresses. Whichever flooring solution you choose, it will help the party atmosphere flow. If you’ve ever been to an outdoor party without a dance floor, you’ll know how difficult it is to get people dancing. Don’t forget, if you don’t plan to have music, opting for a flooring solution that helps to define areas and provide walkways will give your event tent a better flow and feel. Flooring also helps to keep bugs and mosquitos at bay. Whatever your event, contact Main Attractions today. We’ll help you to select all the fixtures and fittings to make your outdoor gathering the event of the year.